Original Bugaboo front wheel kit suitable for the Bugaboo Bee³. Calculate your worldwide shipping quote from your shopping cart. 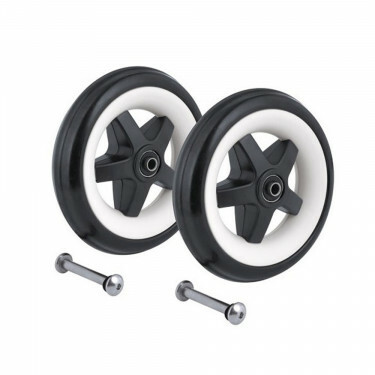 Original Bugaboo Bee³ front wheel kit, complete with mounting kit. Kit contains two complete front wheels. This item is only suitable for the Bugaboo Bee³. When you order something from Babycare.nl you are buying a high-quality product. Every product is covered by a statutory warranty, which means that a product has to do or is what you as a customer can expect from it with normal use. The standard warranty period on your purchase is 2 years. There are exceptions on the warranty period that you can find in the 'extra information' tab for each product. Some products offer an extended warranty. The manufacturer can apply additional conditions. For example Bugaboo, Maxi-Cosi and Quinny have extended warranty periods that apply when you register your purchase via the manufacturer's website. Products or parts of products that are subject to normal wear and tear such as clothing, coverings and wheels are always guaranteed against production faults; normal wear is not covered by warranty. Within the European Union your guarantee claim is handled free of charge. When a guarantee claim applies, Babycare.nl will provide replacement parts or repair for free. This includes shipping fees within the EU. Our global warranty includes the same guarantee period, and free replacements or repairs but exclude shipping fees. Please do not hesitate to contact support@babycare.nl if you have questions about the functionality of a product or when you need to have an article repaired.